An Ant Bicycle was parked outside of the Garment District store on Broadway in Cambridge. Boston is mounting a counterattack against a new threat breaching its borders: an invasion coming on two wheels. In the first — but probably not the last — flare-up in an inevitable bike-share border war, Boston is seizing vehicles from a Cambridge startup called Ant Bicycle, whose sudden incursion has tested the city’s ability to keep up with the fast-changing bike-rental industry. “It’s the pace of the technology meeting the pace that our municipalities move at,” said Stacy Thompson, director of the Livable Streets Alliance, a transportation advocacy group. Ant is one of a growing number of so-called dockless bike companies, which offer an alternative to traditional public cycling systems like Blue Bikes (formerly Hubway). Blue Bikes requires users to pick up and drop off bikes at stations spread out around Boston, Brookline, Cambridge, and Somerville. It has a virtually exclusive territorial arrangement in those municipalities. Dockless systems bring new competition to the market. They offer a different model, allowing riders to find and rent bikes with a mobile app, and ride them wherever they like for a fee, such as $1 for a 30-minute ride. Dockless bikes have quickly appeared on urban roads around the world and are poised for a massive expansion in Boston’s suburbs. An Ant Bicycle parked near Cambridge Brewing Company is seen in Kendall Square. But officials in the Blue Bikes municipalities say the dockless systems aren’t welcome, because the Blue Bikes contract designates the company as the sole bike system. That makes Ant a problem. Its app says Ant’s hunter-green bikes are already scattered across downtown Boston and the other Blue Bikes communities. 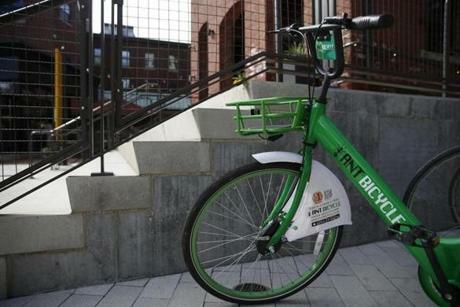 Boston has begun impounding Ant bikes at a South Boston facility, said a spokeswoman for the Boston Transportation Department, Tracey Ganiatsos. Ant’s business development director, John Gallagher, said the city has taken 20 to 30 bikes this week. He said Ant is not deliberately putting bikes on Boston’s streets; instead, it is trying to work with private developers who own large parcels to offer residents or workers a bike system on their campuses. Meanwhile, Somerville Mayor Joseph Curtatone has sent Ant a letter warning that the company is not permitted to operate in his city, and Cambridge is “developing enforcement policies,” city spokesman Lee Gianetti said. Ant is partnering with four property owners in the Blue Bikes territory, Gallagher said, though he would name only one: Corcoran Jennison, which allows Ant to operate at a Dorchester housing development. If riders from those properties leave Ant bikes on city streets, Ant tries to retrieve them, Gallagher said. But, he added, there’s only so much they can do. Boston city officials, however, have lost their patience. “Unfortunately, Ant bikes are being abandoned at locations around the city and, even though [the Transportation Department] has contacted Ant about the problem, it doesn’t appear that the company is making an effort to retrieve them,” Ganiatsos said. An Ant Bicycle parked near Cambridge Brewing Company. The issue will become more complex this summer, when thousands of dockless bikes from other companies are deployed in 15 Boston suburbs, including Milton, Newton, and Medford. 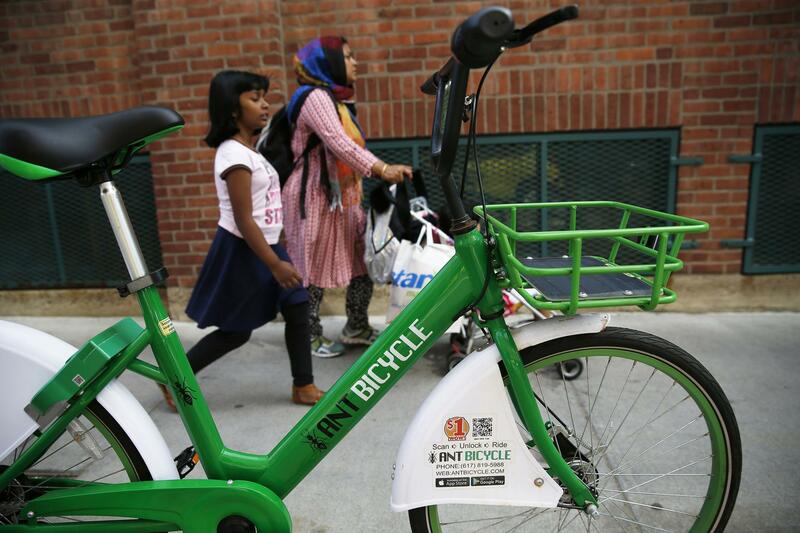 Those municipalities gave blessing to two national companies, Spin and Lime, through a regional agreement established by the Metropolitan Area Planning Council — the same regional agency that helped establish Hubway in 2011. Other local governments are striking separate agreements that could further muddy things. Ant, for example, has permission to operate in Swampscott, while Quincy has an agreement with another company, Ofo. The systems are meant to offer rides around the cities and towns they’re permitted in. Nonetheless, officials expect users to ride the bikes into the forbidden Blue Bikes territory. The Blue Bikes system is owned by Boston, Brookline, Cambridge, and Somerville but operated by the private company Motivate under a revenue-sharing agreement. Motivate declined to comment. Eric Bourassa, the MAPC’s transportation director, said the Blue Bikes communities want to protect their significant investments in vehicles and equipment. Government and company officials must develop strategies to enforce the rules, Bourassa said. He offered ideas like in-app messages to riders, technology to prevent rentals being activated in the Blue Bikes markets, and automatic fines for any ride that ends in a Blue Bikes municipality. Lime and Spin both say they want to work with the municipalities, and they have an incentive to quickly collect bikes that are left outside of their territory because their 15-community agreement requires that bikes be available in those places. Still, Lime’s expansion director, Scott Mullen, said he’s “curious to watch” how Boston addresses Ant. Industry officials caution that a more antagonistic approach — which they believe Ant has taken in Boston — could ultimately undermine the bike business. “If the cities aren’t . 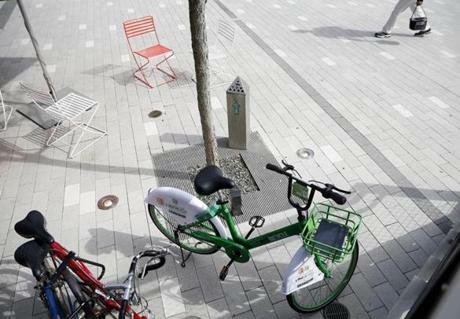 . . driving toward bike-share in a constructive way, you’re going to see lower adoption,” said Tim Ericson, the chief executive of Zagster, which operates a bike system in Salem and Lexington. US cities have taken varied approaches to the rise of dockless bikes — and to the competition that they bring. Seattle eliminated its station-centric system and replaced it with a dockless program. Washington, D.C., allows both business models. Chicago recently made way for dockless bikes — but it will require equipment that locks the bike to a structure, addressing a common complaint that free-standing dockless bikes clutter up private property, parks, and sidewalks. In New York, Motivate has exclusive rights for a station-centric program in parts of the city; officials are considering launching a dockless system in other areas. And in San Francisco, Motivate allowed one company to operate a dockless system despite the city’s exclusive deal — on the condition that it only offer electric-assisted, not pedal bikes. Blue Bikes could still expand into other Boston suburbs, and it may eventually offer its own dockless bikes, said Brad Rawson, Somerville’s transportation director. But even then, he acknowledged, several companies would still be operating with different territorial borders. “We have the system we have,” Rawson said. But she said the Blue Bikes municipalities should study the reasons riders cross borders and consider changing their rules. Banning rides between places with only dockless bikes and those with Blue Bikes could ultimately lead to some people not riding bikes at all. “Biking between Medford and Somerville is a service you don’t have access to right now,” she noted.